Today, is my 2nd race in Belgium this year. 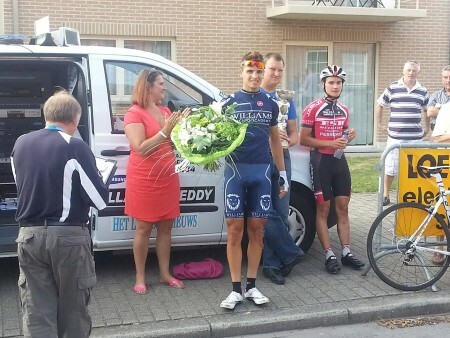 I was here last august(2012) for 3 weeks as a nieuweling, and had 1 victory in Wichmaal on August 6th. One year anniversary. I had a special feeling, and a friend of mine who is living in Wetteren, from my home(Miami Florida ) came to Errondecham to watch the race. I also thought of my hard training in America, and all the support my family has given to me. At the start of the race, I got a feeling for the course, and then attacked after the first ronde. I had first 1 rider with me, and then 2 more. We were 4 riders for several laps. After half the race, maybe 4 more came to us, and we had maybe 7 riders in the breakaway. I have 4 riders in the peloton, who I wanted to give them a chance to attack if the peloton catch us. I did fair work with the other riders. Very hard, and then with 1 ronde left, one rider attack, and I didnt want to chase him. He got a big gap, and then one more rider go with him. I knew if I wanted to win, I would have to attack the breakaway. With 3k remaining I attacked and reached the 2 riders. I worked with them until 1k then I attack and sprint out of all the corners. When I crossed the line first I had many emotions. I felt that all the hard work has payed off. I had not a win since a local pro race in Miami in January! In Miami we race very early, and I started my season on January 7th. I hope my team and me can share many more victories in Belgium. It means a lot for an American to win in Belgium. "Amerika heeft niet de wielercultuur zoals in België. België is het land van de Ronde van Vlaanderen, Gent-Wevelgem en Kuurne-Brussel-Kuurne. Het is voor ons belangrijk dat je kan winnen in België. In België wordt er zeer hard gereden." voegt Jake er nog aan toe.